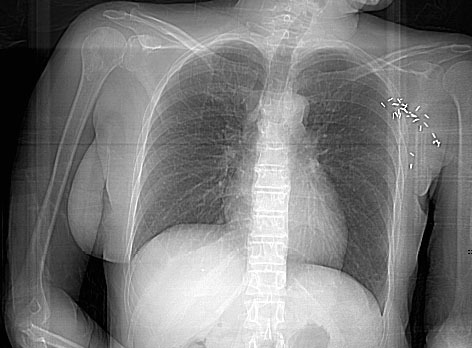 Below is a radiograph of the chest. What are the findings? 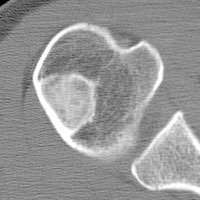 What screening studies might you consider in this patient? Did you notice the absent left breast shadow? This patient has had a left mastectomy for recently diagnosed carcinoma of the breast. The surgical clips show that she has had an axillary dissection for nodes. With multiple positive nodes, appropriate screening studies might include a CT of the liver and a radionuclide bone scan to rule out metastastic disease, prior to beginning chemotherapy. On bone scan, this woman had a a hot spot on her proximal right humerus. 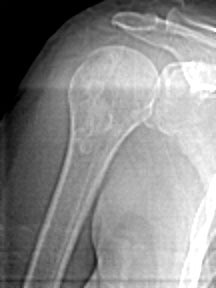 Do you see anything on this more detailed view of the humerus? What is your diagnosis now? 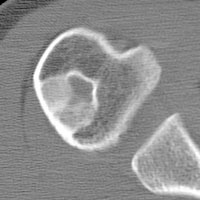 Is there any other imaging method you would like to see next? 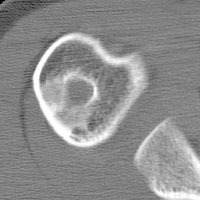 This digital radiograph shows a sclerotic lesion in the proximal right humerus. 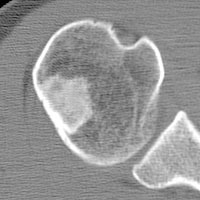 Since this lesion is hot on bone scan, one would certainly have to consider the possibility of a metastasis. However, before rushing right into a biopsy, we should get a better look at the lesion first. CT would be a good way to do this.